The management of the GPFG has some clearly visible attributes: rigorous, systematic strategies; low cost; insignificant exposure to opaque markets and unlisted assets; low idiosyncratic, operational risk; and an emphasis on social responsibility, (e.g. Chambers et al. 2012). These attributes reflect the various dimensions of an asset management philosophy: strive to do the right thing for the public good; respect science and the body of accumulated financial knowledge; handle financial wealth as part of total national wealth; respect the forces of competitive markets; strive for objectivity when assessing the competitive and comparative advantages of publicly-owned institutions; and respect the democratic obligation to anchor the investment strategy among all constituencies. The prudent approach to asset management reflects the investment strategy adopted when the fund was established. The discovery of large oil and gas resources off the continental shelf in the late 1960s represented a significant increase in the asset side of the national balance sheet. The value of these new assets fluctuated with the world price of oil and gas. This lead Norway to establish a sovereign wealth fund to deploy the lessons of financial economics to manage this risk and maximise the nation’s wealth. The first deposit to the sovereign wealth fund was made in 1996, and subsequently the government’s proceeds from oil and gas extraction have been traded for equity and bonds on world markets, thereby converting oil and gas reserves into a claim on the production of the global economy. This strategy was a straightforward application of the most fundamental lesson of financial economics: risk sharing and diversification (e.g. Merton 1971, and many others). And it has made Norway wealthier as a consequence of the improvement in expected returns relative to risk. Norway has also carried a part of global equity risk. This was not only profitable ex ante, but has also proved profitable ex post. The recent collapse of world energy prices, which lowered the value of Norway’s outstanding oil and gas assets, would have been much larger if national wealth hadn’t been diversified – instead, it was partly offset by an increase in the value of the foreign equity portfolio. Decisions on how to manage the financial part of national wealth, i.e. the GPFG, have also been a reflection of respect for rigorously tested scientific insights. When the sovereign wealth fund was established there was limited asset-management experience within the public sphere. The basic strategy and trade-off between bonds and equities closely followed the capital-asset pricing model (Sharpe 1964, Lintner 1965, Mossin 1966) and the canonical model for dynamic asset allocation of Mossin (1968), Samuelson (1969) and Merton (1969). Using these as guiding models, the equity share of the portfolio was set to 40% in 2000 and increased to 60% in 2007. The management of the financial portfolio is grounded in respect for competitive international financial markets, understanding of arithmetic, and awareness of principal-agent challenges in delegated asset management (Samuelson 1974, Sharpe 1991). Negligible scope for speculative, discretionary bets means that the returns of the fund have followed value-weighted global markets closely. Years before index management came into vogue, the financial part of Norway’s national wealth was managed as a de facto index fund. Being large makes this particularly profitable, as there are considerable economies of scale to systematic strategies in listed, transparent markets. For a large fund, this further improves expected returns net of costs. The success of this approach to wealth management testifies to the soundness of the accumulated body of research in financial economics. The economic gains from the establishment of the sovereign wealth fund have come from applying core insights to improve the risk-return trade-off for the nation’s total wealth. This has facilitated high and stable public and private consumption and investments. Our recommendations for the strategy of the GPFG going forward build on the same core principles. • Political experiences handling idiosyncratic and operational risks. The asset side of national balance sheet consists mainly of the present value of future labour income, financial assets outside Norway, physical capital in Norway, and oil and gas reserves. In order to move towards an optimal risk-return trade-off, all items on the national balance sheet should be taken into account when making a recommendation on the bond-equity allocation. 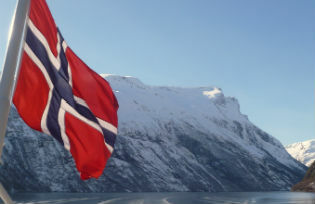 Few other countries are facing the same kind of economic decisions as Norway. That may be one reason why there are few studies analysing the financial portfolio decisions at a national level. There is, however, a clear parallel to studies of household portfolio choice with nontradable income risk, such as Bodie et al. (1992), Benzoni et al. (2007), Cochrane (2014) and others, on which we can build. Despite the fact that the potential gains are large, the entire asset side has not been sufficiently analysed due to lack of resources. The committee’s focus has therefore been on a subset of the asset side: the combined financial wealth outside Norway and outstanding oil and gas reserves. The remaining oil and gas reserves have been substantially reduced in the last ten years since the last assessment of the bond-equity allocation. Since a globally diversified portfolio of equities and bonds is much less risky than the value of oil and gas reserves, the risk associated with financial wealth and oil and gas reserves combined has been reduced. Conditional on the assumption that the current allocation was optimal when that decision was made, then the bond share of the financial portfolio should be decreased and the equity share should be increased. The liability side of the sovereign wealth fund is the net present value of future private and government consumption and investments. Since the unconditional expected rate of return of the financial fund is channelled into the domestic economy through an annual transfer to the government, the level and dynamics of government consumption and investments is particularly important. As the financial fund has grown, these transfers have become a larger and larger part of government budgets. Widely accepted results about deadweight losses from taxation imply that tax rates should not vary year by year (e.g. Harberger 1971). The level of public services such as pre-school care, schools, universities, hospitals, and care for elderly should also be kept at a stable level year by year. Formally, this means that the fund’s owners not only want to smooth their spending of the fund in the usual forward-looking sense, but also have a preference for backward smoothing so as to avoid sharp changes in taxes or government services in response to varying financial returns. This problem may be analysed with a Constantinides (1990) or Campbell and Cochrane (1999) habit model. In such models, stable tax rates and counter-cyclical spending means strong habits, and effectively high risk aversion. The implication is that, everything else equal, the equity share of the financial portfolio should decrease in share of the government’s budget financed transfers from the fund. Conditional on the assumption that the current allocation was optimal when that allocation decision was made and the spending rule is unchanged, then the equity share of the financial portfolio should be decreased and the bond share should be increased. Expected returns on any portfolio may be decomposed into a risk-free component and expected compensation for risk exposure. Bonds issued by the largest and most advanced economies in the world are usual proxies for almost risk-free rates. Yields on these bonds have shown a secular downward trend during the two last decades. As a result, the expected rate of return of the current reference portfolio has declined. Changes in expected returns due to changes in the risk-free rate should not have any implication for risk taking and hence the bond-equity allocation. Excessive risk taking in search for yield is a grave fallacy. Understanding the link between asset markets and the broader economy, and the joint dynamics of financial markets returns and distributions of economic quantities is crucial for allocation decisions. During the last two decades, there has been enormous progress in the intersection of financial economics and macroeconomics. Researchers have explored a wide range of alternative preferences and market structures. A sampling of these are: (i) recursive preferences and long-run risk (Epstein and Zin 1989, Bansal and Yaron 2004), (ii) habits (Constantinides 1990, Campbell and Cochrane 1999), (iii) rare disasters (Barro 2006), and (iv) idiosyncratic risk (Constantinides and Duffie 1996). The tests and further contributions that have followed these papers have improved the foundations on which we can make allocation decisions. Rigorous systematic strategies based on the accumulated body of financial knowledge do not only deliver a constrained-optimal risk-return trade off. It is also profoundly democratic since it is based on open, non-rival knowledge, which may be anchored with all constituencies. The committee’s report is an example of this. Risks and expected returns associated with systematic strategies may be communicated to the public. This is in stark contrast to operational risks or idiosyncratic risks associated with speculative bets, which are not possible to quantify and communicate ex ante. Experience has also shown that the public has much less acceptance for losses due to discretionary bets or operational mistakes than losses due to systematic market movements. Insignificant exposure to opaque markets and unlisted assets and low idiosyncratic, operational risk allow for higher systematic market risk and a higher equity share than what would otherwise have been advisable. Norway’s approach to wealth management has served the country well. The economic gains have come from applying core insights from financial economics to improve the risk-return trade-off for total national wealth. Despite the huge realised gains from the partial diversification of the asset side and the fact that further gains are potentially large, the entire asset side has not yet been sufficiently analysed. There are most likely also substantial gains in revisiting the allocations across sectors and regions, both for bonds and equities. The improvements in the understanding of time-variation in risk premia also put the rebalancing rule between bonds and equities in a new light. To reach an allocation recommendation, the committee discussed the crucial margins identified by financial economics and briefly described in this column. There was, however, disagreement within the committee on the relative weighting of the asset and liability side. All agreed that the risk associated with financial wealth and oil and gas reserves combined has decreased, but there was disagreement on the analysis of the liability side. A majority of the committee recommends that Parliament increase the equity share of the reference portfolio to 70%. They explicitly assume that the fiscal policy framework will be adapted to accommodate increased financial markets risk. A minority of the committee recommends that Parliament decrease the equity share of the reference portfolio to 50%. This recommendation follows from the analysis of the current fiscal policy framework and that it is not adapted to handle the current level of financial markets risk. Bansal, R. and A. Yaron (2004), “Risks for the long run: A potential resolution of asset pricing puzzles”, Journal of Finance 59(4), 1481–1509. Barro, R. J. (2006), “Rare disasters and asset markets in the twentieth century”, Quarterly Journal of Economics 121(3), 823–866. Benzoni, L., P. Collin-Dufresne, and R. S. Goldstein (2007), “Portfolio choice over the life-cycle when the stock and labor markets are cointegrated”, Journal of Finance 62, 2123–67. Bodie, Z., R. C. Merton, and W. F. Samuelson (1992), “Labor supply flexibility and portfolio choice in a life-cycle model”, Journal of Economic Dynamics and Control 16(3/4), 427–50. Campbell, J. Y. and J. H. Cochrane (1999), “By force of habit: A consumption-based explanation of aggregate stock market behaviour”, Journal of Political Economy 107, 205–251. Chambers, D., E. Dimson, and A. Ilmanen (2012), “The Norway model”, Journal of Portfolio Management 38 (2), 67–81. Cochrane, J. H. (2014), “A mean-variance benchmark for intertemporal portfolio theory”, Journal of Finance 69, 1–49. Constantinides, G. M. (1990), “Habit formation: A resolution of the equity premium puzzle”, Journal of Political Economy 98 (3), 519–43. Constantinides, G. M. and D. Duffie (1996), “Asset pricing with heterogeneous consumers”, Journal of Political Economy 104, 219–40. Epstein, L. G. and S. E. Zin (1989), “Substitution, risk aversion, and the temporal behavior of consumption and asset returns: A theoretical framework”, Econometrica 57(4), 937–69. Harberger, A. C. (1971), “Three basic postulates for applied welfare economics: An interpretive essay”, Journal of Economic Literature 9(3), 785–97. Lintner, J. (1965), “The valuation of risk assets and the selection of risky investments in stock portfolios and capital budgets”, The Review of Economics and Statistics 47(1). Merton, R. C. (1969), “Lifetime portfolio selection under uncertainty: The continuous-time case”, The Review of Economics and Statistics 51(3), 247–57. Merton, R. C. (1971), “Optimum consumption and portfolio rules in a continuous-time model”, Journal of Economic Theory 2(4), 373–413. Mossin, J. (1966), “Equilibrium in a capital asset market”, Econometrica 34(4). Mossin, J. (1968), “Optimal multiperiod portfolio policies”, Journal of Business 41,215–229. Samuelson, P. A. (1969), “Lifetime portfolio selection by dynamic stochastic programming”, Review of Economics and Statistics 51(3), 239–46. Samuelson, P. A. (1974), “Challenge to judgement”, Journal of Portfolio Management 1(1), 17–19. Sharpe, W. F. (1964), “Capital asset prices: A theory of market equilibrium under conditions of risk”, Journal of Finance 19(3). Sharpe, W. F. (1991), “The arithmetic of active management”, Financial Analysts Journal 47(1). Espen Henriksen is an Associate Professor of financial economics at BI Norwegian Business School. He has previously and most recently been affiliated with the University of California – Davis, Norges Bank Investment Management, the University of California – Santa Barbara, and the Norwegian School of Economics (NHH). Knut Anton Mork earned his Ph.D. in Economics from the Massachusetts Institute of Technology in 1977. Upon work as a Research Associate at the M.I.T. Energy Laboratory from 1977 to 1981, he served on the faculties of the University of Arizona from 1981 to 1983 and the Owen Graduate School of Management at Vanderbilt University from 1983 to 1990. In 1992 Mork was appointed full professor at BI Norwegian Business School in Oslo. In 1996 he became Chief Economist for Norway for Handelsbanken. He served in this position until retirement in 2016. He is currently teaching macroeconomics and finance at the Norwegian University for Science and Technology (NTNU).